In this tutorial, you will learn to use break to terminate a loop. Also, you will also learn about break labels. Suppose you are working with loops. It is sometimes desirable to terminate the loop immediately without checking the test expression. In such case, break is used. It terminates the nearest enclosing loop when encountered (without checking the test expression). 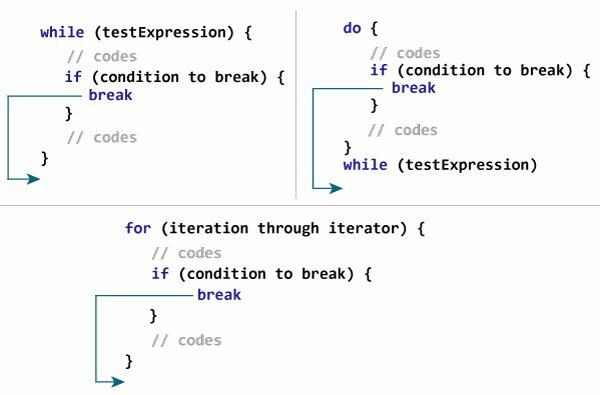 This is similar to how break statement works in Java. If testExpression is evaluated to true, break is executed which terminates the for loop. When the value of i is equal to 5, expression i == 5 inside if is evaluated to true, and break is executed. This terminates the for loop. The program below calculates the sum of numbers entered by the user until user enters 0. Visit Kotlin Basic Input Output to learn more on how to take input from the user. Here, the while loop runs until user enters 0. When user inputs 0, break is executed which terminates the while loop. What you have learned till now is unlabeled form of break, which terminates the nearest enclosing loop. There is another way break can be used (labeled form) to terminate the desired loop (can be outer loop). Label in Kotlin starts with an identifier which is followed by @. Here, test@ is a label marked at the outer while loop. 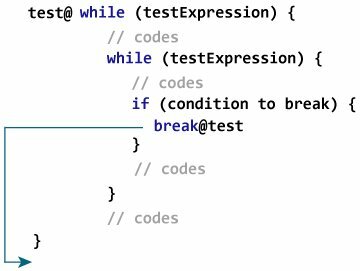 Now, by using break with a label (break@test in this case), you can break the specific loop. Here, when i == 2 expression is evaluated to true, break@first is executed which terminates the loop marked with label first@. Here's a little variation of the above program. In the program below, break terminates the loop marked with label @second. Note: Since, break is used to terminate the innermost loop in this program, it is not necessary to use labeled break in this case.